High concentrations of ground-level ozone are a problem in and near urban areas and along the Lake Michigan shoreline. Ground level ozone (O3) is a secondary, warm weather pollutant that is formed through chemical reactions of combustion by-products and organic gases. 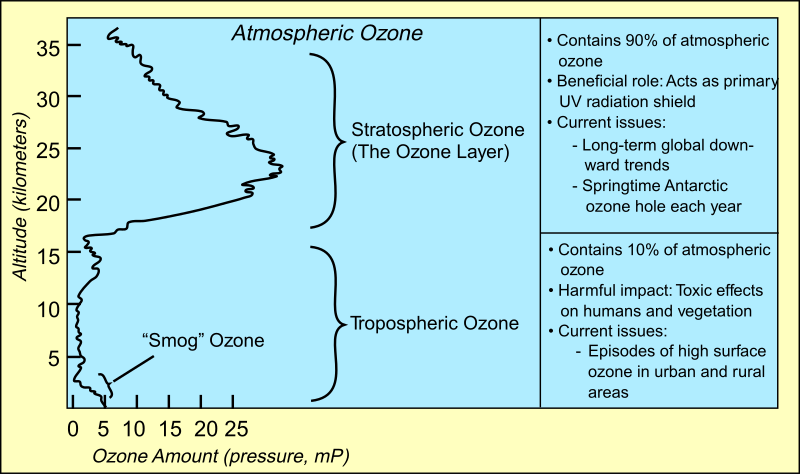 Ozone high in the atmosphere (stratospheric ozone or the ozone layer) is good. It absorbs incoming UVB radiation from the sun which is harmful to plants and animals. Ozone at ground level (tropospheric ozone or smog) is bad. Emissions from man-made and natural sources react in the presence of sunlight to form O3 near the Earth’s surface. Breathing O3 can trigger a variety of health problems, particularly for children, the elderly, and people of all ages who have lung diseases such as asthma. Ground level O3 can also have harmful effects on sensitive vegetation and ecosystems. LADCO’s work on air pollution targets ground-level ozone. Ground-level O3 is created by chemical reactions between nitrogen oxides (NOx) and volatile organic compounds (VOC) in the presence of sunlight. Man-made sources of NOx include combustion sources, such as power generation, industrial processes, and automobiles. Natural sources of NOx include soil microbes, wildfires, and lightning. Man-made sources of VOCs include industrial processes, paint and solvent applications, and fuels, such as gasoline. Plants, including trees and crops, are the most abundant natural sources of VOCs. Ozone chemistry is driven by energy from the sun and is most active during the summer when the days are long and the sun is high in the sky. 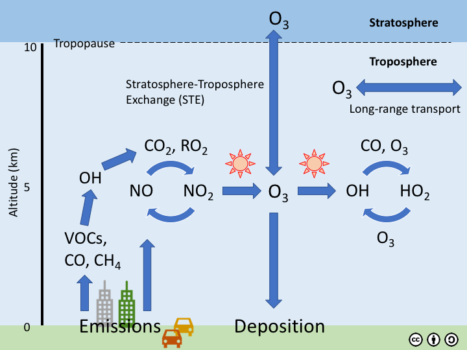 The schematic of the O3 cycle at the left illustrates how primary emissions of VOCs and NOx (NO + NO2) react in the presence of sunlight to form O3. Non-chemical sources of O3 include stratosphere-troposphere exchange (STE) and long range transport of O3 formed upwind. Ozone sinks (removal processes) include chemistry, STE, deposition to plants and the Earth’s surface (dry deposition), and removal by precipitation (wet deposition). Ground-level O3 is most likely to reach unhealthy levels on hot sunny days in and downwind of urban areas. Ozone can also be transported long distances by wind, so even rural areas can experience high concentrations. Elevated ground-level O3 concentrations are most frequent in our region from April to September, when temperatures are high, wind speeds are low, and sunlight is most intense. The highest O3 concentrations in our region are observed along the shores of Lake Michigan. We typically observe these conditions when a surface high pressure system sets up just to the south of the lake. The southerly flow during these conditions transports O3 and its precursors from large urban and industrial sources on the south end of the lake northward out over the lake. A natural lake-land breeze circulation pattern is a major cause of the high O3 concentrations observed along the lakeshore. This pattern is driven by surface temperature gradients between the lake and the land. At night and in the early morning a land breeze (land –> lake) forms when the lake surface is warmer than the land surface. As shown in the left panel below, the land breeze transports O3 precursors from industrial and mobile sources on land out over the lake. When the sun rises, the O3 precursors over the lake begin to rapidly react to form O3, and high over-lake concentrations are often observed during the summer. A lake breeze (lake –> land) forms when the land surface becomes warmer than the lake, typically in the early afternoon during the summer. The right panel below shows that the lake breeze transports the concentrated O3 and precursors from the lake, inland to a narrow band along the lake shore. The O3 concentrations observed along the lakeshore that violate the National Ambient Air Quality Standards are often associated with lake-land breeze patterns. It is important to note that coastal ground-level O3 problems are not unique to the Lake Michigan region. Similar land-water breeze driven O3 problems also occur near the Chesapeake Bay, the Long Island Sound, and around Houston, TX. While we can simulate the high lakeshore O3 concentrations using complex computer models of air pollution, the model skill has been limited in capturing the exact timing and extent of the lake breeze circulation. This movie shows hourly surface ozone concentrations on July 17-18, 2011 estimated by a LADCO model simulation. The simulation shows a classic regional O3 transport episode over Lake Michigan in which O3 and its precursors are transported from south to north over the lake and the surrounding areas. The movie starts just before sunrise (05:00 am CDT) on July 17 and runs through 11:00 pm CDT on July 18. High O3 forms over Lake Michigan on the first day and transports north throughout the afternoon and evening. One the second day of this episode, the flow carries O3 from the southern end of the lake to the northeast into the Lower Peninsula of Michigan. The Lake Michigan Ozone Study (LMOS) in May-June 2017 had the objective of improving our knowledge of the science of lakeshore O3 formation. The U.S. EPA Ozone Pollution website provides information on O3 science, control strategies, and policy.